I had already proposed my first book, to be titled The Food Lover's Guide to Paris. Leaving my job as a food writer for The New York Times, the idea of moving to Paris for "graduate" work in food seemed like a good idea. I always wondered what food writers in Paris did between meals. I wanted to explore more than restaurants: I wanted to know which pastry shop offered the best croissants, which market would offer the freshest and most most spectacular produce, fish, meat, and cheese, which baker would win my heart with the crustiest sourdough bread, and where on earth would I find the most sublime and seductive selection of French cheeses. Soon I was writing restaurant reviews for the International Herald Tribune, and at the same time began sharing, as well, all my extracurricular food experiences with the world. And so was born my love of Paris, France, and writing about French food. The Food Lover's Guide to France followed, along with 12 other books, and most recently a complete revision of that first labor of love, The Food Lover's Guide to Paris, as a book and as an app for the iPhone or iPad. Famed bestselling cookbook author Patricia Wells creates a blueprint for success in the kitchen with this superb collection of recipes drawn from her cooking schools in France—the perfect successor to Julia Child’s classic The Way to Cook. This newly researched, completely rewritten edition "cracks the code" of the Parisian food scene. Includes 40 recipes. 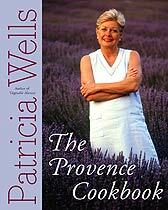 A collection of my favorite recipes and lessons from my cooking classes in Paris and Provence. Recipes and stories that capture the essence of the black diamond. Healthy main-dish salads for every season. A scrapbook of our life in France. This book will alter the way you look at markets, menus and seasons, putting vegetables at the center of the plate. This book is a window into my Provence: come into my kitchen and share with me the sunshine of this extraordinary part of France. Simple and robust fare inspired by the small family restaurants of Italy. Over 150 recipes inspired by my favorite Parisian cafes, bistros, wine bars, markets, cheese shops and restaurants. Recipes inspired by my farmhouse in France. The artistry of a master chef and his protégés. Presenting the cuisine of Joël Robuchon. 200 recipes inspired by the family restaurants of France. Taste France as the French do, venturing beyond Paris to savor the gastronomic pleasures of the glorious French countryside. The indispensable guidebook to Paris -- by the incomparable French food authority.